Wheat Grass has sometimes been called nature's finest medicine. Packed with vitamins, minerals and all the amino acids necessary to build and maintain a healthy system, Wheat Grass helps boost your natural immunity, increases your stamina and energy and may also reduce your risk of some serious diseases. Some people have claimed it keeps their hair from graying! Wheat Grass is said to improve and purify our blood and it is believed to alkalize the body and restore our blood to a healthy pH balance with the modern diets that contain too many processed foods, along with the stress of our life which can make our blood too acidic. The consequences of this are that our bodies store too much water and build up cholesterol in the arteries to protect us from this blood imbalance. Wheat Grass is believed to neutralize toxins and carcinogens in the body, which helps our body's own immune system to naturally resist disease and guard against certain kinds of malignancies. There has been some research done on this herbal formula that relates to diets high in chlorophyll, to help in lowering the rates of colon cancer. It is thought to have an excellent effect on the blood, it purifies, improves blood sugar disorders and reduces high blood pressure. It is also believed to increase blood flow and generally detoxify the body. Wheat Grass is filled with vitamins, minerals and amino acids that provide every natural nutrient necessary to sustain and build optimum health. It is also thought to enhance the rapid absorption and assimilation of nutrients by the body. One area in which Wheatgrass is superior to other vegetables is its content of vitamin B12, which is a vital nutrient. Wheat Grass is said to increase energy and stamina. Also helpful for improving digestion, increasing metabolism, increasing vigor and for recovering from stress or illness. Wheat Grass, in clinical trials, has shown it can reduce the symptoms associated with ulcerative colitis. 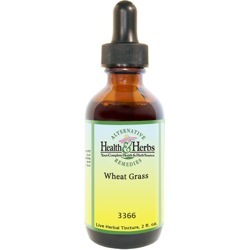 Researchers found the patients who received Wheat Grass had significantly lower disease activity and rectal bleeding, therefore it is an effective treatment. Wheat Grass expands when it is hydrated and can give you the feeling of being full, and many people have reported that this reduces the cravings for food. Its fiber content is thought to promote colon health. Wheat Grass has been attributed to the prevention of tooth decay and gray hair growth. Ingredients: Wheat Grass, Structured Water, 20% Alcohol. Non-Alcohol: Wheat Grass, Structured Water, Vegetable Glycerin. Contraindications: Currently, there are no known warnings or contraindications with the use of Wheat Grass.